You know that in order to build a successful online presence, you have to have great content and compelling images. But did you know that the source of your content and images also has a significant impact on your overall success? What Are The Components Of A GREAT Social Media Campaign? You want your social media presence to be great, and rightly so. A top-notch social media presence is a great way to increase website traffic, generate leads, boost online sales, and enhance your overall presence and reputation. These Ingredients Can't Come From Just Anywhere. Unfortunately, the ingredients of a great social media campaign can also be the source of serious problems. Right-clicking and saving images from a Google search or taking a screenshot of an infographic may seem like an easy (and tempting) way to get images to enhance your own social media campaign, but giving into this temptation can put your business at risk. Copyright laws exist to protect content owners from having their work stolen in this manner. 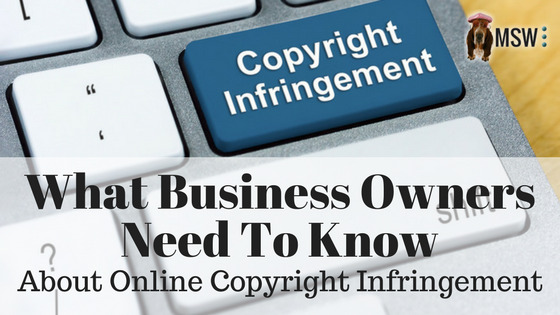 Using content you do not own is essentially stealing, and your business could face legal challenges if the content owner were to file a copyright infringement claim. When In Doubt, Don't Use It. Images, written content, videos, and music are all protected under copyright laws. Generally, the person who creates the content is automatically granted sole ownership under copyright law. There are some exceptions that allow certain individuals to use certain pieces of content in certain situations, but as you have probably guessed, it can be hard to know exactly when/if those situations apply to you. If you are going to share someone else's content, it is important that you always provide links and referrals to the original source you used. Sometimes, however, you may not be allowed to share a piece of content even if you give credit to the original source. Before sharing written, graphic, or visual content you find online, it's important to do your research. Carefully read through the licensing agreement or copyright statement provided by your original source to find out what their terms are. A complete discussion of the copyright laws governing online content is beyond the scope of this article, but a good general rule of thumb is this: when in doubt, don't use it. The only content you can be 100% confident you own is a picture you took or something you wrote. Violating copyright laws is often the biggest risk business owners face when they choose to do their social media campaigns in-house with employees or ask their teenage (or adult) children to assist with the project. If you don't know the original source of your content, images, you may be putting your business at risk. It's all included in our standard monthly fee. Just another way we put the web to work for small businesses! Can We Help With Your Social Media Campaign? Give us a call at (573) 552-8403 or visit our website to learn more about our social media setup and engagement packages. We would be happy to help in any way we can!